My name is Andrina Flinders and I am currently the Head Teacher and Special Needs Co-ordinator at Fullbrook Nursery School. I am passionate about creating an inclusive school and, as a team, we are committed to ensuring that we meet every child’s need so that they are able to reach their full potential. 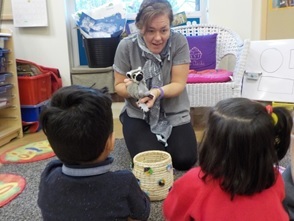 I have been the SENCo, at Fullbrook, for the past 3 years and during this time we have continued to develop our practice and knowledge to offer the outstanding provision which our children access. We have a vast experience in meeting the various needs of children and working in close partnership with lots of other agencies; such as Educational Psychology and Speech and Language Therapy. Our SEN Information Report is available on this website and it details how we identify and support children with additional needs. If you have any questions please feel free to ring me at nursery or come in to see me.